The study of coin values and past trends may predict future price movements for many U.S. coins. Do coin values and past trends predict where the price of your coin is headed? It didn’t take much to get me hooked on studying U.S. coin values as a youngster. When I was an 8-year old, I naturally idolized my older brother. 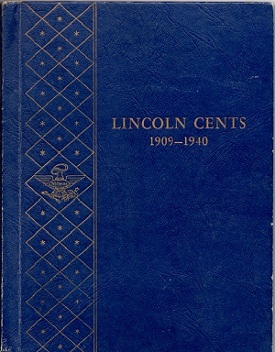 He and his buddies spent countless hours with their Lincoln Cent coin albums. That was all it took to ignite my passion for U.S. coins. As I grew older, I also became fascinated with their place in history. …which eventually led me to develop this website. Like so many from my generation, I got started collecting coins with the Lincoln Cent. This was my first album, which I started filling as an 8 year old. I never did find a 1909-S VDB from circulation or piggy banks, but it was fun looking! I've come a long way since then. Now I can share with you the information I’ve gathered over the past 40-plus years that has made coin collecting a thrilling and fulfilling pursuit for me. I’m pretty much just like many of you – I've always wanted to know what a coin is worth and, more importantly, why. At the same time, I've maintained a natural curiosity in how strongly it might rise in value in the years ahead. I've discovered that long term price trends of a coin ARE INDEED a fairly reliable indicator of where its value could be headed in the future. For a very long time, I've been gathering lots of data supporting this observation. I created a series of Coin Value Tables (see a sample table below) to report my findings. …you won’t find these tables anywhere else. If selecting coins with a good chance of increasing nicely in price is your goal, you'll find the tables to be an indispensable tool. You may access the tables by selecting the U.S. Coin Values (historic) link in the Nav Bar to the left. You can also get there by clicking HERE. Coins are so steeped in U.S. history that I’ve included for you some historical context for each coin. This helps explain the origin and differences between coins. Because of my love affair with U.S. coins and history, I've done my best throughout this site to interject historical connotations while analyzing coin values and other subjects related to numismatics. The idea of the MINT HINT is give you a chance to quickly absorb a factoid about the featured coin or whatever the numismatic topic might be for that page. You can quickly decide if you want to continue reading for more in depth information or keep moving on. A longtime favorite of coin collectors, the 1796 quarter has posted solid value growth for many decades. The coin has performed very well recently, increasing by an average of more than 10.00% annually since the year 2000. Photo courtesy of Ira & Larry Goldberg Coins & Collectibles Inc., Beverly Hills, CA. I guess I have never lost the respect and adulation of certain coins I developed as a kid trying to be like my older brother. I have spent many years preparing the tables, charts, data and recommendations you will find on this site because I believe you should have access to the best and most complete coin value information possible all in one place. Are you looking for a life-long hobby you can master? Have you inherited a coin collection and need to know what it is worth? Are you a collector pursuing an elusive coin? If so, you're bound to unearth useful information somewhere on this site. A coin that has long enthralled me is the 1796 Draped Bust Quarter. A beautiful example of this incredible rarity is pictured to the right. You see, I have a keen interest in very early United States coinage. I get goose bumps owning coins that once upon a time might have been held by one of our Founding Fathers. 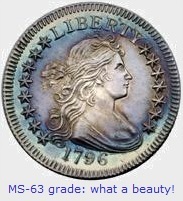 Although I may never be able to afford a 1796 Draped Bust Quarter (the one in the picture is now worth over $100,000 -- but it's a real screamer! ), I have found the pursuit of that coin (or at least its not-quite-as-valuable cousin) a thrilling chase. Maybe someday my dream will come true. to give you the confidence to estimate the value of coins you already own. Thank you for your readership and enjoy! As we can see from the sample table, the 1889-CC Morgan silver dollar has displayed solid, if not spectacular, value growth over a very long period of time (although things of not gone so well since 2007 for some grades -- a great buying opportunity!). Any coin collector fortunate enough to own one of these Carson City rarities need not worry about selling at a loss down the road. The table demonstrates that the 1889-CC dollar is a good choice for continued appreciation in the future. You may use the Navigation bar on the upper left hand side of the page to take you to major sections of this site.